Ever since I was a child, I always had a knack of making the simplest changes on ordinary accessories to bring them to another level that fits my personal style and brings a smile to my face. Since my NYC apartment is so tiny, I'm constantly looking for creative ways to bring light and life into the space. So when I brought this diffuser set to the apartment, I realized that it blended in too much with the white walls of the apartment. Although the white looks nice and crisp, I still wanted to make it stand out. I felt that it needed something to elevate its style; it needed an element of fun and pizazz. Normally I would have painted it but there's no outdoor or sufficient space to do this thus, the idea of some glitter nail polish was a perfect and quick solution for this project. And what girl doesn't like sparkly things? 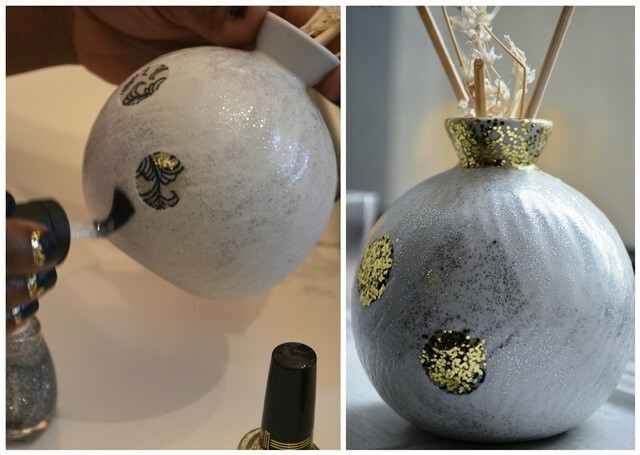 I immediately went to town bedazzling the body of the vase with the silver glitter - and for contrast I decided to fill-in the circles and the lip of the vase with the gold glitter. What a simple, quick and affordable way to bring a subtle sparkle accessory to a shelf that might have otherwise felt dull or ordinary. Now this pretty vase has double duty: filling your space with continuous fragrance while adding a decorative elegance. 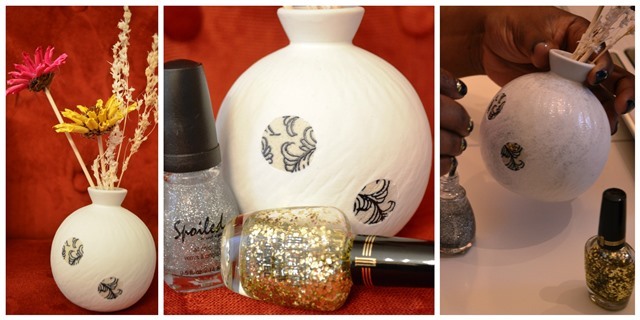 For this simple project: all that is needed is one or two of your favorite glitter nail polishes (I used Spoiled silver glitter + Milani gold glitter) and five minutes of your time. I strongly believe that love is in the details. Hope this idea inspires you to put your personal stamp on your space. Have fun!